Clifton Hill Interchange – Alternative Options? Why is the Linking Melbourne Authority inflicting a high impact flyover on Clifton Hill and Collingwood? The flyover was not required in an earlier design. connection to the proposed tunnel. Full connections to Hoddle Street are to remain. Options to reduce the number of lanes between Alexandra Parade and the Eastern Freeway can be investigated, depending of the extent of works proposed to aid access between the Eastern Freeway and the CBD. Options for deep and shallow tunnels have been investigated. 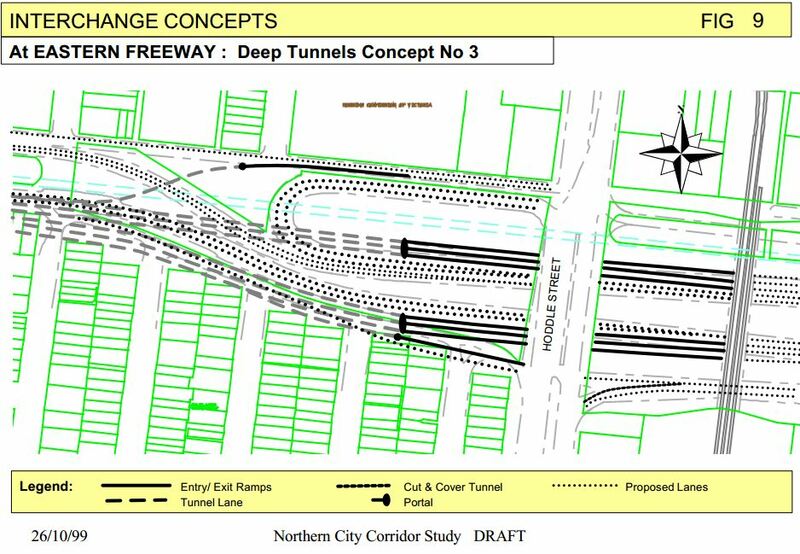 The option that appears to have the greatest potential has tunnelling commencing between Alexandra Parade and the railway bridge with split portals for the entry / exit tunnels west of Hoddle Street. The tunnel heads mainly in a westerly direction. This concept provides entry/exit access in a west / east direction respectively from the Freeway as well entry/ exit at Hoddle Street. The major advantage of this option is that it provides for full interchange movements between Hoddle Street and the tunnel /Eastern Freeway as well a wide range of traffic movements / alterations on the exiting ramps and/or carriageways during the construction period. The main disadvantage is the requirement for land acquisition for the southern tunnel requirements.” From VicRoads 1999 Study Tunnel Options provided to the NCCCS study. The 1999 version has portals much closer to Hoddle Street. Three freeway lanes slopes down to the tunnel from the railway bridge. It retains the loop from Hoddle Street onto the freeway, and utilises the land inside the loop that contains a row of early elms. 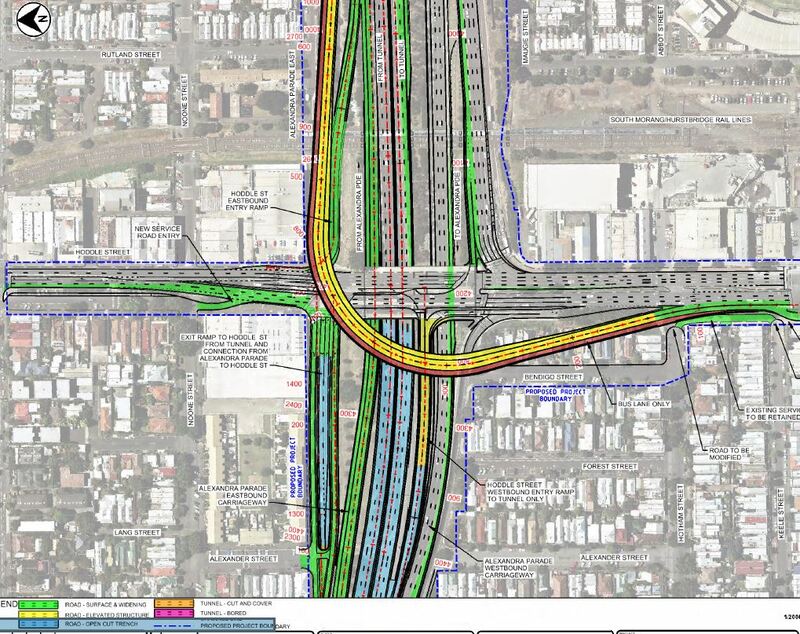 Update: FOI documents obtained by The Victorian Greens show this interchange design was still being considered in 2012. Like so many aspects of this project, the options have not be explained, even though legislation requires the proponent to explain the alternatives. We are left to wonder whether it is to save costs, or to allow for a future Hoddle Street freeway. Note that Hoddle Street north of the freeway is to be widened, even though the traffic model predicts no increase in traffic anywhere on Hoddle Street. The 1999 design keeps the single lane for traffic from the west to turn left to Hoddle Street north, and a single lane to turn right into Hoddle Street south. This is sufficient today – so why the need to double the capacity? Is it just that traffic is more bloated now and the sponsors hope for more bloating? The 1999 plan does not require as much destruction of historic houses in the heritage precincts of Bendigo Street, Gold Street or Wellington Street. There is also a reduction in noise and pollution impacts, as trucks and buses will exhaust more fumes climbing the ramp, while their engine brakes will keep Clifton Hill awake at night as they descend from ~10m above the railway bridge onto the eastern freeway. These are proper questions for the panel to consider. This design is certainly not needed. Bulldosing so many houses due to dodgy modelling has justified widening an already wide road. There are alternatives and they are not taken up. The proposed implementation is the most expensive obviously building a massive on ramp which will go for up to 2 kilometres from start to finish as well as compensating those directly by it. If the government does not generously compensate those with existing propoerties, why did they bother generously compensating those in EVO who had no entitled to it? Former EVO owner here. I wouldn’t call it generously compensated. Our compensation is less than what those who are going to be acquired will receive. The difference between our situation is and those who will be compulsory and voluntarily acquired is that the valuations will be a lot better. In our situation, the Valuer General did the valuation and we had no option of using an independent valuation. In normal acquisition, its a negotiation in valuation between the VGV and your own independent valuation. However, the why is a fair point. According to the government, it’s because they needed access to the common area, thus triggering compensation. They could have easily saved $80M and moved the onramps south by a couple of meters. Rumor has it that there was some backroom deal with the developer to make sure the onramp crossed the common property. I suspect its about keeping foreign investors happy. EVO had many apartments owned by foreign entities as well as developers. Remember property investment especially from overseas is what is propping up the Victorian economy. If the government is willing to spend $80M when they don’t have to, why don’t they spend the extra money and make the tunnel entrances on the Eastern half like they are in the Northern Corridor report. It would be worthwhile asking lma authority these questions a the next opportunity. I expect that they will use the term collateral damage at some stage. I wouldn’t trust them to put out the rubbish! For Neil – good information. It seems the Libs are skewed on a spit with an apple in their mouths. If they listen to the minority who has money, then they have a problem. The public understands that nothing makes sense with this project, especially when they do not honestly disclose vital information for scrutiny. For Barry – the LMA has a good reputation for saying it is not their decision nor their fault. So, they are a beaurocracy who provides protection to the decision makers. This project has all the warning signs of planning in a great rush, just to get construction going before the next election. Planning on the run is the last thing you’d want to do on such a complex and massive project. The way they are rushing it almost guarantees there are going to be big stuff ups and possible financial failure even if their dodgy, hugely optimistic traffic forecasts eventuate, and they won’t. It’s going to be a financial disaster like Brisbane’s Clem7 tunnel and Airport Link – combined!